When it comes time to upgrade the outdated and inefficient windows in your home or business, there are a lot of options. One option that you should definitely consider is that of a double pane, NFRC rated energy saving vinyl window systems. Double pane energy efficient windows offer a lot of advantages over a single pane window, making it an excellent choice for most homes especially those looking to conserve energy. One of the main reasons someone would get a dual pane energy efficient vinyl window is that it helps to regulate the temperature in your home more efficiently. Since double pane windows are engineered using spacer technology between two panes of glass, the windows work to keep heat trapped inside the home, slowing through process of losing thermal heat through the glass in the winter. Today’s windows incorporate a smart glass technology referred to as low-emissivity glass that works in such a way that it reflects heat back to its source helping homes to stay warmer in the winter and cooler in the summer. With better insulation comes lower energy costs. Multiple experts have explained the significance of heating and cooling costs and the impact of replacing outdated inefficient windows. Since your home or office won’t have to work as hard to heat or cool down a home – because of the double pane window better sealing the room – you will ultimately spend less on energy costs. So while double pane replacement windows may cost more now, the savings in the long run usually compensates. Now that your home is more energy efficient, you’ll also help out the environment. Since double pane, energy efficient windows keep your home from burning more fossil fuels, you’ll help to lower the CO2 emissions into the air. Every little bit helps when it comes to saving the environment, and double pane windows are one way to do your part. Not all of us are fortunate enough to live on a quiet countryside. Some of us have noisy neighbors, or a lot of traffic outside of our office. If you want to quiet things down, double pane windows with a high quality spacer system canalso greatly benefit in noise reduction especially when replacing single pane windows. Whether you’re looking to replace the windows in your home or office, double pane windows are a good choice. They offer benefits to both types of locations, and have plenty of styles available to suit both needs. Another great benefit of double pane, energy efficient windows is that they improve your home value. Whenever it comes time to sell your home, you want it to be worth as much as possible. 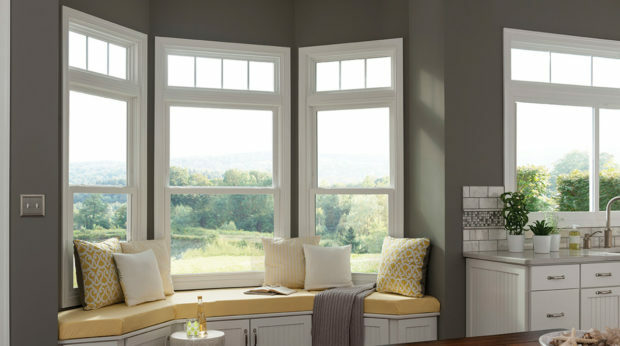 Newly replaced, energy efficient dual paned windows can provide many benefits to selling your home, from raising the value to improving the time in selling the home. Double pane windows give your home another selling point, allowing you to get more for it. Double pane windows don’t just improve the value, but they also make the home look better. With so many styles and options available, when you upgrade your home with newly installed energy efficient double pane windows, you can be sure the beauty and curb appeal will increase as well. Vinyl continue to excel as the consumer’s choice for window replacement because of its tremendous energy savings benefits combined with low maintenance and long-lasting appearance. In most cases, the vinyl exterior does not require painting and if using premium materials also does not warp or fade over time allowing your new windows to perform consistently for many years. As you can see, there are plenty of advantages to getting double panevinyl windows that incorporate modern energy saving technologies. When the time comes to upgrade the windows in your home or office, keep these advantages in mind, and weigh them against the initial cost increase. You will likely find that paying more now is a small inconvenience compared against all of the advantages new energy efficient windows offer.